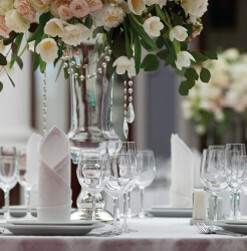 Richlin Catering - With Over 20 Years Experience Making Events Spectacular! The Venue that listens. The Venue that impresses. A rich history of unrepeatable events. Tickets are ON SALE for the 2019 Summer Crab Feast! Check our calendar for this year's dates! Contact us at 410-671-7500 or stop in and meet with one of our Wedding Specialist to see what Richlin Catering has to offer and to hear about our Incentives! I just can’t say enough. People are still talking about it and said it was the best wedding they have ever been too. What a wonderful night! The staff was amazing…the DJ was top notch. The food was delicious and plentiful. The centerpieces and the whole set up was absolutely beautiful. I will definitely give you great reviews! Everything was wonderful, the food, the staff and service. We were informed that they were working on the roof at the time of our meeting, but we did not hear a thing so awesome acoustics the ballroom. Thank you for your hospitality and we look forward to our next business meeting being held at the Richlin Ballroom. Our luncheon at Richlin on Saturday was fabulous!!! The ladies were very impressed with the elegance of your facility, the purple tablecloths (!) and the DELICIOUS food. I heard nothing but compliments all day. Many had never been there before, and all were impressed. I must say, the WAS delicious—you were right about the chicken marsala—it was one of the best I have had. All of it was great—and the desserts were to die for!! The staff was very courteous and attentive as well. I have absolutely no complaints and did not hear ANY negative comments—which, as you know ladies can be critical. When we got back at the end of the day and met up with the men, the ladies were rubbing it in to them about the great lunch we had (they had sandwiches). We all were very pleased with Richlin—the ambiance, food, service—all were excellent. It was also very nice to see our name on your marquee, welcoming us. I will definitely not hesitate to book something at Richlin in the future. Everything went smoothly and the food was great! There was plenty of food and everyone seemed happy with the options. I appreciate your guidance with the event. Thank you so much for all of your help in the planning and coordination of our holiday party. I just wanted to send a quick “Thank You.” Everything was absolutely amazing. I greatly appreciated the prompt replies and patience while I was planning this event with our management team. Please thank your staff for their hard work & attention to service. The event went great! As always things ran very smoothly and we got a lot of compliments that the food was delicious! I can’t say enough about how beautiful the room looked. The food was incredible from start to finish. Please compliment the chef on a job well done! Sue, Roland, Kathleen and the rest of the wait staff could not have been nicer. Every one of them went well above and beyond their duties to make our evening a fantastic one; and it was! I would highly recommend The Richlin Ballroom to anyone looking to host an event. From the minute, you walk in, there is a warm and friendly family feeling among all staff. Keep up the good work and hopefully I will see you real soon for another fantastic event! I just wanted to take a moment and tell you what a wonderful job Kelly did today. She set up and kept things nice and tidy and took great care of our executives and made sure to be kind and courteous to everyone. She’s a gem and we would love to have her back. She was so easy to work with and really nice to talk to as well. While I was running around she kept in touch with me texting to let me know what was going on so I could keep the executives on track with their meal and meetings. Thanks so much for sending her and we would love to have her back again for future events. Hats off to your team! It was awesome, the food was delicious and the decorations were awesome, service was outstanding. Only thing I would change that is just a lesson on my part is spacing of the tables and not have a big dance floor area. Some of the late arrivers thought they didn’t have a chair but there were chairs just hard to find. Our direction said he wouldn’t change a thing, it was awesome! Thank you so much for all you and your staff did. Kelly was so attentive!!! Thank you for accommodating us with all of the little things. Everything went well and everyone had a great time. Sue was great and very patient with us when our time lime was slightly off. Everything was seamless and we had no complaints from our employees. Thanks so much for your time and effort that was put into making our event was a success. Everything was delicious! Everyone loved it and wished we would have started using you 7 years ago, when we started parties! Thank you so much. I know we will be in touch next year. Everything was perfect on Saturday! All of our family and friends are still talking about how great of a time they had. Soooooo many compliments on how delicious the food was and how attentive the bartenders were. We will be sure to recommend Richlin to any and all friends/family looking for a venue for an event. Thank you again for everything it was exactly what we had pictured for our wedding celebration! Everything was great. Food, service, atmosphere was awesome as always. You have a great staff who always asked if need anything and was very gracious. Thanks again for all your help and we look forward to next year. Everything was great! We got rave reviews about the food from our guests and Dave, AS ALWAYS, was wonderful. Tell Dace and Jude that we thank them so much! On behalf of my Family, I would like to extend a huge thank you to you and your Team at Richlin for providing picture perfect service at our aunt’s Birthday Celebration. Thank you very much for helping us celebrate her 90th Birthday in such a beautiful way. The service, the food, the atmosphere, everything…was wonderful. Thanks again! Everything went great – Your team of folks really know what they’re doing and the food was delicious too – your staff is just top notch! Thank you for allowing us to use your facility on Saturday. We had a blessed time and the staff was AWESOME!!!!! Kudos to all that were working our event on Saturday!!!! The food was an excellent choice.I tried to stay of task to have our event over and done with so your staff can get things changed over for your next client. And I do pray that we were able to get out before the next event started, if we didn’t, I do apologize from the bottom of my heart.I will keep you in mind if I/we have another event in the future. I was absolutely blown away by the entire evening! The bar service and after party food was excellent! The oyster bar looked great and I heard they tasted great as well (I don’t eat them myself). Thank you, I really appreciate everything you guys did for us. Thank you for the follow-up email. Our event was fabulous on Friday night. You and your staff were so easy to work with and everything was thought out perfectly. Our guests loved the food variety and the ice cream was a big hit! We will definitely be back next year! The day was a great success! Thank you so much for all of your help. Have gotten nothing but compliments for how the day unfolded. Especially would like to thank Kelly for all her help. She even realized I didn’t have a change to eat breakfast and brought me a plate. That is going above and beyond. Thanks to you for making all the back and forth planning go smoothly. It was a pleasure. The food was absolutely the best and the gentleman who delivered it was very polite and did a great job setting up. I would highly recommend you for any type of catering. Hoping I can do this for our annual Christmas Party. Thanks!! Family-owned and operated for 30 years, Richlin Catering & Event Center has a proud history of providing finely executed events both on-premise and off. 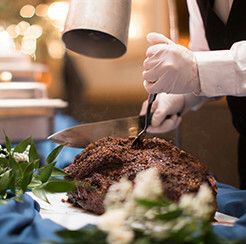 Serving the communities of Harford County, Upper Chesapeake and Baltimore Metro Regions, we’ve built our reputation on quality menus and exceptional service, competitive pricing, and a personal commitment to every client to make your event a success. Weddings and special family celebrations. Fundraisers and sports banquets. Corporate events and local, community recognitions. 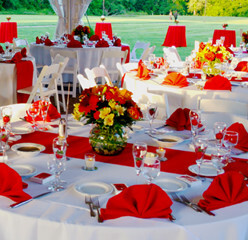 No matter the occasion, we customize your affair to your budget, your audience, and your imagination. Follow our boards on Pinterest and Like our Page and Subscribe to our Events on Facebook. We post the money saving tips and the hottest trends for planning your wedding reception, your business meeting, your sports banquet and much more. From ideas for fundraising to DIY centerpieces and budget strategies, you’ll be inspired and guided through your event planning from industry experts and consultants. © 2019 Richlin Catering. All Rights Reserved.